Trade links had existed between the two countries for as long as anyone could remember. Egypt was a key part of the old spice and trade routes between Europe and Asia. British traders had been loading and unloading their cargoes in Ottoman waters for generations. British military and political interest in Egypt first manifested itself as it became obvious that in the Eighteenth Century, India was falling under the influence of Britain (and away from France). Despite, the direct sail routes around the Cape of Good Hope, Egypt still provided the quickest way of maintaining communications between Britain and India. It required a brief overland journey, but it was still substantially quicker than circumnavigating Africa. At this point, it seemed as if the British forces would remain in place and that Egypt would just have remained under British control. Unfortunately for the British, in 1805 a vigorous Egyptian leader came to the fore, known as Muhammed Ali. He took control of the Mameluke army and defeated the British in 1807. This setback forced them to withdraw from Egypt. The British would not formally return for another 75 years. For the first part of the Nineteenth Century, Britain remained rather hostile towards the Egyptians. Partly due to wounded pride, but also because supporting Egypt would have compromised one of their other stated policy aims, that of protecting and bolstering the Ottoman Empire. This stance was primarily undertaken as a counterweight against Russian influence in Eastern Europe, but it meant that the British found themselves defending Turkish interests in a number of unlikely areas. One such area was to be that of Lebanon, Syria and the Holy Lands in the 1830s. In 1832, Muhammed Ali took advantage of a Russia defeat of the Ottomans by declaring Egypt as independent. Emboldened by the plight of the Ottomans, he advanced into their Near East dependencies. At the time, there were serious political implications in Europe as the French and Russians tried to gain capital out of the ailing Ottoman fortunes. Whilst Britain, supported by the Austrians, desperately tried to maintain the last vestiges of Ottoman power in the area. Things turned even worse for the Ottomans as they launched an unsuccessful offensive against Muhammed Ali's Egyptian forces. The Ottomans were defeated at Nisibin and their fleet mutinied and went over to the Egyptians. At this point, the British and Austrians stepped in to save the Ottomans, and landed forces in Lebanon. These forces defeated the sitting Egyptian army and, combined with a fleet despatched to Alexandria, forced Muhammed Ali to submit and to reign back his forces. After this event, British attitudes towards Egypt began to improve. Although the idea that Egypt would become a British colony was regarded by most as being highly fanciful. It was the French who were thought to be the most active in the North Africa region. They funded the Suez Canal and steadily increased their economic base in the country. British interest in Egypt developed during the American Civil War. At this time, British mills were starved of cotton. Alternative sources had to be found and one such source was to be Egypt whose cotton was actually a particularly good quality product. British companies began investing heavily in the production of cotton in Egypt. The hugely ambitious public works programs of the ruling Khedives also attracted British businessmen and their wares. Although, Egypt's inability to pay for these modern conveniences was not yet thought to be a barrier to trade. British strategic interest in Egypt was captured in 1869 when the Suez Canal was officially opened. The sailing times from London to Bombay were dramatically cut. British maps and ideas of the world had to be radically altered. The fact that the canal was controlled by the Khedive and the French government was initially a serious concern to the British. Although, It is from this point on that British decisiveness and speed of actions which consistently outwitted and out-manouevered the French and brought Egypt under Imperial British control. 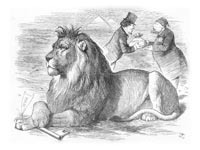 The first opportunity to pull away from the French was in 1875 when it became obvious that the Khedive had got himself into serious economic difficulties. The only way he could stave off creditors was by raising a seriously large amount of money. It was at this point that Disraeli was able to step in and offer to buy the Khedive's shares in the Suez Canal Company. The speed of action on this event left the French reeling. Overnight, the British went from being a minority shareholder to being the controlling shareholder. Her influence had grown considerably as a result. Unfortunately for Egypt, the money raised by the sale of her shares, was only enough to keep the government afloat for a few years. In a government reliant on patronage, structural economic reforms were difficult to implement. In only a few years the Egyptian government was again in economic difficulties. This time, the British and French governments initiated a stewardship of the finances of Egypt. In effect, this stewardship was little more than a joint form of colonization. British and French experts were to be sent to the various ministries in order to take control of day to day business of them. The Khedive's unwillingness to agree to such loss of control was rewarded by his forced abdication and replacement by his son Tawfiq. The steady loss of sovereignty was keenly felt by many Egyptians. So much so that in 1882, Arabi Pasha initiated a revolt from inside the Egyptian army. In June of that year, riots broke out against the Europeans in Egypt. From this point on Britain took the initiative. The French refused participation in a bombardment of Alexandria due to political problems back at home. Surprisingly for a Liberal government, The British finally resolved on intervention and sent an expeditionary force to the Suez Canal. The Arabists were rapidly defeated at Tel el-Kabir in September and Cairo was occupied the next day. Accidentally, the British had found themselves to be masters of Egypt. The unusual circumstances that conspired to give Britain such power and influence over Egypt also meant that she could not technically be considered a colony. Egypt had not been discovered by the British, nor had they requested British suzerainty. And yet, the British controlled the finances, government personnel and armed forces of the country. This ambivalent status would remain for many years. Internationally, the French were kicking themselves because they let the British take the prize of Egypt from under their noses. Technically until 1914, Egypt was still nominally under Ottoman control, a fiction that suited the British for the time being. In matters concerning the international status of Egypt, the decisions were taken in London, but where the internal administration of the country was concerned, The Consul General's opinions were usually conclusive. The facade of Khedival government was retained, British advisers attached to the various ministries were more influential than their ministers, while the Consul General steadily increased his control over the whole administrative machine. Attempts by Khedive Abbas Hilmi to challenge British authority over the status of British officers commanding Egyptian forces on the Sudan border resulted in something of a humiliating climbdown. However, nationalist aspirations continued as resentment towards British officials and their extra-territorial rights rankled. Nationalist aspirations found an early spokesman via Mustafa Kamil who established a school for Egyptian children and a newspaper to articulate nationalist demands. Hopes that the French would aid his cause were dashed in the early years of the Twentieth Century as European politics realigned the international order. The international status of British control over Egypt remained uncertain for nearly twenty years. It was not until the French and British decided that they needed each other and formed the Entente Cordiale that they decided to come to agreement over the status of Egypt. They basically agreed that Britain should be paramount in Egypt, and the French should have a free hand in Morocco, Tunisia and Algeria. Theoretically, the British occupation was supposed to have been temporary and the British had hinted that they would leave a number of times. However, as the Suez Canal continued to grow in importance and after 1904, when Great Britain and France agreed on a division of interests in North Africa which left Egypt as the British share, the conviction grew that the British had no intention of leaving. A growing number of educated Egyptians were less convinced of the merits of European control as they saw all the most important decisions and jobs remaining in European hands. A growing tide of nationalism was beginning to find its voice and soon would find a cause. The Denshawai Incident in 1906 accelerated ill will towards British high-handedness. A group of British officers had been out hunting birds near the village of Denshawai. The villagers, who relied upon the birds for food, intervened. In the resulting scuffle, one officer was hurt, became separated and later died died of sunstroke, despite the efforts of a friendly Egyptian to help him. Both men were then found by a party of British soldiers who, assuming the fellah had murdered the officer, beat him to death. The British authorities over-reacted as they regarded this incident as the byproduct of nationalist stirring. A special tribunal was set up to try the villagers. Of the 52 accused, four were sentenced to death, two to penal servitude for life, six to imprisonment for seven years and the rest to 50 lashes. The sentences of hanging and flogging were carried out on the site of the incident - and the villagers were compelled to watch. The effect on Egyptian opinion of the savage punishment of the villagers was electric. There was almost universal Egyptian condemnation for the "atrocity" of Denshawai and the Nationalist cause was boosted signifcantly. Egyptian nationalism had hitherto drawn its strength mainly from Muslim revivalists such as from the Muslim university of el Azhar in Cairo who opposed the British, not as foreigners, but as 'infidels'. Their nationalism was Pan-Islamic rather than Egyptian, and was concerned to maintain the traditional order. But in 1907 the older nationalist groups under Mustafa Kamil were swept aside by a new nationalist party, Hizb al-Umma, 'the Party of the People', which, as its name indicated, set out to obtain popular backing and had a programme of modernization and social reform. Its leader was Saad Zaghlul, later to become famous as the founder of the Wafd, the main vehicle of post-war Egyptian nationalism. Saad, who had been Lord Cromer's minister of education, was not at this stage anti-British. On the contrary, he believed that co-operation was necessary to carry through the reforms which would enable Egypt to play an independent part in the modern world. The Liberal government back in Britain decided to try and take a more liberal approach in Egypt by appointing Sir Eldon Gorst to bring in reforms and attempt to nullify the nationalist surge. Unfortunately, this policy came to a shuddering halt when the Coptic Egyptian Prime Minister who Gorst had encouraged the Khedive to appoint, Boutros Ghali Pasha, was assassinated by a nationalist student in 1910. It had not helped matters that Boutros Ghali Pasha, despite his reforming reputation, had been the President of the Denshawai tribunal. Gorst's own health was declining and he would die of cancer the following year. The Liberal government took the opportunity of this vacancy to return to a more reactionary and traditional bureaucrat in the form of Lord Kitchener of Khartoum who was at the height of his prestige and fame. Kitchener ruled along the lines of an Oriental potentate with more ceremony but also listening to petitions from Egyptians. His decisive and autocratic manner clashed with the Khedive who he resented and wanted to see replaced and the Ottoman office terminated. Ideally, he wanted to create a new viceroyalty of Egypt and the Sudan, within the Empire, with himself as Viceroy. He introduced more police and legal powers to confront the rise of more militant nationalists although he did also introduce some limited reforms to help coopt the influential sectors of Egyptian society. The most important reform was the introduction of a Legislative Council with an electoral, although severely restricted, component. Only the wealthiest landowners were eligible to stand or to vote. These limited may have born more fruit if given time to develop however everything was about to change in 1914 as war broke out in Europe and Kitchener was suddenly recalled to return to Britain as Secretary of State for War. The Great War was to temporarily increase British imperial control over Egypt. Almost immediately, the press was muzzled, nationalist meetings were prevented from occurring or broken up and the new Legislative Council was suspended. After the Ottomans declared war on the allies on October 29th 1914, the British moved swiftly to break the technical link between the Ottoman Empire and the status of Egypt. The fate of the Suez Canal was just too important to take any chances and technically it was in enemy territory if Egypt was indeed a suzerain of Turkey. Indeed, Britain declared that the Canal was closed to all but allied and neutral shipping - despite international agreements to the contrary. Additionally, they deposed the Turcophile Khedive Abbas (who happened to be in Turkey at the time of their declaration of war) and created the new title of Sultan of Egypt on 19 December 1914 and engineered the pro-British Hussein Kamel to ascend the new position. The newly created Sultanate of Egypt was declared a British Protectorate rather than colony meaning that its people were subject of the Sultan rather than of King George. Hussein Kamel's accession brought to an end the de jure Ottoman sovereignty over Egypt. But when Great Britain proclaimed this protectorate over Egypt in 1914, Saad Zaghlul's benign attitude towards British rule changed fundamentally. The proclamation of the British protectorate united many of the different opposition groups in Egypt, and would become the starting point for Zaghlul's new nationalism after the war. During the war though, Egypt soon found itself on the front line of action as the Turks sought to take control of the Red Sea and threaten the Suez Canal. The British were able to contain these threats with help from imperial forces from India, Australia and New Zealand. The Dardanelles Campaign brought yet more imperial troops into the country as both a staging area and as a recovery point. Egypt was then used as a base to launch a land offensive towards Ottoman lands in Palestine and Transjordan. Inflation ravaged the country as the effects of the world war were felt. Martial law was imposed for the duration of the war. Even more concerning for some was the forced requisitioning of draught animals forced labour conscription. Nationalists were convinced that the British were using the war as an opportunity to convert the temporary protectorate into a permanent colony and certainly to suppress their nationalist aspirations, but with so many soldiers in the country and with such stringent laws in place under the excuse of maintaining the peace during wartime, there was little the nationalists could do but bide their time until the war had finished. The post-war international climate saw an increase in ideas of self-rule and independence - partly inspired by talk of Wilson's 14 points, but also by a surge in national identities brought about by the war. Egypt's nationalists, temporarily, saw how the rest of the Ottoman Empire was being divided up and wanted to be granted similar rights. Within days of the armistice Saad Zaghlul, the unofficial leader of Egyptian nationalism, headed to the British High Commissioner in Egypt, Sir Reginald Wingate, and informed him that the Egyptian people wanted their complete independence and that he would like to lead his delegation to London to negotiate with the British government. The British government initially refused mindful of the continued importance of Egypt as a strategic concern. They did relent to say that they would meet with the Egyptian Prime Minister, but sensing the change in nationalist sentiment in his country, he not only refused but resigned. Saad Zaghlul called for a nationwide revolt. However, as martial law had not yet been rescinded, the authorities used their extensive powers to arrest Saad Zaghlul and deport him to Malta. This further inflamed nationalist sentiment and escalated into the 1919 revolution. Riots broke out and Lord Allenby and Milner were despatched from Britain to try and ascertain what to do next. They quickly came to the conclusion that it was better to grant independence to pro-British Egyptians rather than wait for nationalists to take power for themselves. Saad Zaghlul was released and allowed to return from Malta much to the joy of many Egyptians. However, negotiations over granting independence whilst still maintaining British troops in key positions, especially with regards to the Suez Canal, dragged on for two more years. Saad Zaghlul was once more sent into exile to the Seychelles, yet in reality both Allenby and Milner were of a like mind and resented the fact that it was politicians back in London who were delaying the inevitable. Eventually, it was Allenby who threatened to resign if independence were not granted. Lloyd George finally capitulated and agreed. In 1922, the protectorate was officially ended. However, Britain still reserved four matters to their own discretion: the security of imperial communications, defence, the protection of foreign interests and of minorities, and the Sudan. Technically, Egypt was independent. But the real power behind the throne was never really in question. Attempts to further reduce British involvement in the economy and political situation were made throughout the 1920s and 1930s but usually came undone over the status of the Anglo-Egyptian condominium of Sudan. Furthermore, the newly installed King Fuad resented the constitutional challenges from the Egyptian Parliament and oscillated between undermining its power and having to turn back to Parliament to raise money. This lack of political stability in Egypt undermined its own influence. However, the Italian invasion of Abyssinia in 1935 concentrated minds and a renewed negotiation with Britain finally bore fruit with a new Treaty in 1936. The treaty, under which Britain still retained a prominent if diminished influence, was to run for 20 years; both parties were committed to negotiating a further alliance in 1956, at which point Egypt would have the right to submit to third-party judgement the question of whether British troops were any longer necessary in Egypt. The British occupation of Egypt was formally ended, though British troops were to remain in some areas. As Egypt's self-defence capability improved, they would be withdrawn gradually to the Canal Zone and Sinai where their numbers would be limited to 10,000. And Britain reserved the right of reoccupation with the unrestricted use of Egyptian ports, airports and roads in war-time. Egypt regained full control over its own security forces. The British High Commissioner became an Ambassador. An Egyptian replaced the British Inspector-General of the Army and the country's military intelligence was Egyptianised. The number of Europeans in the police was to be reduced by 20 per cent a year, although an Englishman, Thomas Russell, scourge of narcotics pedlars, remained head of the Egyptian police until 1946. Britain was to sponsor Egypt's entry into the League of Nations. British residents were made liable to Egyptian law rather than British law as Egypt obtained full rights of jurisdiction and taxation over all residents. The elderly King Fuad was to die shortly after the signing of this document and be replaced by his 16 year old son. At first, the young king seemed to offer a new dynamism but he also seemed to fail to appreciate the full power and influence of the British even after the signing of the 1936 Treaty. It did not help that the young King had medical, alcohol and relationship issues which further undermined his role. When war broke out his lavish lifestyle contrasted sharply with the deprivations of much of his peole. Worse, he seemed to have pro-Axis sentiments which greatly concerned the British when war in North Africa broke out in full force. British power was sharply reminded to the King in February 1942 with the Abdeen Palace Incident. King Farouk had been asked to replace the current government with a Wafd Party government which was assumed would have wider political support and more likely to support the British at a critical time in the North African war effort. When the King hesitated, the British despatched troops and tanks to surround the Abdeen Palace and ask the King to abdicate if he failed to install the new Wafd government. The King capitulated in was certainly left in no doubt as to who the real power brokers still were in Egypt. In the early years of the occupation, when Egyptian finances were in disarray, French hostility to British actions was a serious problem. It was difficult to take bold and effective action. However, from 1889 onward there was a budget surplus and consequently greater freedom of action for the Egyptians and the British. A moderate degree of international agreement over Egypt was attained by the Convention of London (1885), which secured an international loan for the Egyptian government. The guiding hand of Lord Cromer helped to direct funding towards infrastructural reform which included irrigation schemes, the Aswan Dam and improved travel infrastructure. Cotton, light industry and agriculture would all become consistent earners for the government. Egypt was also one of the first non-European countries to exploit tourism especially after the sensational discovery of the tomb of Tutenkhamun in 1922. Unfortunately, the political instability in Egypt in the 1920s and early 1930s made it difficult for any but the most determined to travel specifically to Egypt. However countless tourists passed through Egypt en route through the Suez Canal and many of these alighted for excursions and to see perennial favourites such as the Pyramids and the Sphinx at Giza. The foremost British interest in Egypt was always because of its strategic position. However profitable contracts and business was in the country, it was the fact that Egypt lay between Britain and India that made it so vitally important for the British. This was true even before the Suez Canal was built but was magnified exponentially after it had been completed. It was the communications and transportation hub of the British Empire. British sensitivity to disturbances in the area were partly responsible for the occupation of Egypt in the first place. Further disturbances in Sudan were also to draw British attention to the area. During World War I, Egypt was found to be an extremely useful staging post to launch attacks on the Ottoman Empire. Whereas, in World War II, it was Italian and German interest in the strategic value of the country that led to it being such a bitter battleground. However, it was to be the British themselves who finally pulled the rug from under their own feet. In 1947, India became independent. In this one action, British rationale for holding on to any power over Egypt and the Suez Canal had been lost. Egypt was no longer the epicentre of the Empire. New Superpowers were waiting in the wings to usurp European power and influence. Nationalists also took heart from a shift in international sentiment towards colonialism and imperial powers. Britain was hanging on to the Suez Canal by her fingertips and even her own ally, the United States, was doing much to undermine her historic position of influence throughout the Middle East as oil became an ever important commodity. The Suez Canal was still a vital artery of World trade, it was just that Britain's relative importance in the share of this trade was diminishing and with colonies gaining independence and the rise of air travel, it was becoming less a crucial avenue of imperial communications. In the post war period, the British would have been content to withdraw from active involvement in Egyptian politics. Unfortunately, a new kind of radicalism had entered Egyptian politics. This was partly Britain's fault. The creation of Israel brought the Muslim fundamentalists a new unity and cause to champion. These fundamentalists also drew from the tactics by which the Jewish settlers had extracted their concessions from Britain and the wider international scene. Politics was about to become a much bloodier affair in Egypt. Riots and bombs were directed at both the British and the ruling Egyptian party who were identified as being pro-British. Nationalists were concerned that too many compromises were being made. The Prime-Minister was assassinated in 1948. Guerilla warfare broke out in the Canal Zone. By 1951 a state of emergency had to be declared. Bloodshed was spilled in Ismailia in 1952 which led to serious rioting. The British had sought to disarm Egyptian police in the Suez Canal Zone whom they felt were aiding nationalists and providing arms that were being used against the British. The British commander requested that the Egyptian police lay down their arms and return to Egypt proper. When they refused to do so, some 7,000 British soldiers were deployed to forcibly disarm the police. Some 50 police were killed in the action. The heavy handed nature of the action caused widespread anti-British feeling and saw rioting and arson directed primarily at British run buildings and institutions throughout Cairo in particular. A lackadaisical response from the Egyptian authorities further confirmed British mistrust towards the Egyptian government. The British even considered sending troops in from the Canal Zone to restore law and order - very similar to what they had done in Alexandria back in 1882. Fortunately for the Egyptian government, they did send in their troops just before the British intervened. In the political chaos, the King blamed the government and asked the Wafd prime minester to stand down. He was followed by four more in just the next six months as the government lurched from crisis to crisis. Egypt was ripe for a coup. It was just a matter of who would initiate it. Would it come from the Left or the Right? In the end it was to be the army who filled the political vacuum, they had never forgiven the King for his capitulation at the Abdeen Palace back in 1942 and felt that he was too pusillanimous in his dealings with the British. They ousted the Royal family in 1952 by Colonel Nasser. Almost immediately, Nasser's authority was challenged by General Nequib and the religious right. Nasser managed to gather a coalition of the security forces and working class citizens to hold on to power. Israel's repeated mini-attacks on the Gaza strip was one of the first areas of embarrassment to the Nasser regime. The inability of an army led government to defend itself was particularly embarrassing. At this point, Britain was only guilty of association. Israel was a friend of America, America was a friend of Britain. However, this event started a series of dominoes falling. Aggrieved at American support for Israel, Egypt turned to the Soviet Bloc for military aid. When this was granted, the Americans withdrew funding for the High Aswan Dam and requested Britain do the same. This gave Nasser the excuse he needed to reclaim the Suez Canal Zone. He announced the nationalization of the Suez Canal Company in 1956 in order to finance the dam. This led Anthony Eden to enter into a covert agreement with the Israelis and the French to invade and seize the Suez Canal. Israel regarded a resurgent Egypt with suspiction whilst France had been angered by Egyptian aid to the revolt in their colony of Algeria. Israel would provide the all important pretext for Anglo-French forces to land in the Suez Canal Zone in order to ostensibly restore order and keep the canal traffic flowing. 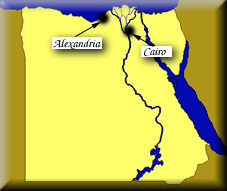 In reality, the Egyptians were able to block the canal by sinking ships in the canal. Furthermore, their Syrian allies destroyed various pipelines disrupting oil flows to the West. Both the Soviet Union and the United States reacted to this colonial escapade with condemnation. The Americans were particularly annoyed at the timing of the event as it coincided with the Soviet crushing of the Hungarian Rising and so provided cover to their Cold War enemies and also as it took place in the week of President Eisenhower's reelection campaign. He had been standing on a peace and security platform which with the Suez invasion and Hungarian Rising did not seem entirely convincing. The Soviets were keen to increase their influence in the region at the expense of the colonial powers. The Americans were similarly keen to replace British influence throughout the Middle East. The disruption of the canal and oil flows hit Britain's economy particularly hard. When they requested support from the Americans to protect sterling they were told in no uncertain terms that this would not be forthcoming unless they withdrew from the Suez. A United Nations Peace keeping force was formed to replace the British and French forces who withdrew in ignominy. The fact that they had conspired with the Israelis also went down badly throughout the largely Muslim Middle East. Nasser was left triumphant (despite his military losses) and the Suez Canal was now firmly in Egyptian hands. Britain's power in Egypt had been lost once and for all. The Superpowers had eclipsed the Colonial powers. Stuart Legg explains how and why Britain became involved in Egyptian affairs and how that involvement spilled ever further south into the deserts of Sudan. Afaf Lutfi al-Sayyid explains how Egypt was able to at least partially extricate itself from British control in the immediate aftermath of the First World War. Peter Mansfield explains developments in Egypt and Sudan in the Twentieth Century and how increasing national aspirations collided with the unusual governance arrangements in place. He explains just how important the Suez Canal was to British strategic concerns and how Britain's inability to relinquish their control of it helped propel her into a disastrous crisis with serious consequences for Britain's Middle Eastern influence. P. B Sweeney recalls the 18 day voyage from Britain to Mombasa through the Suez Canal. 1798 Napoleon arrives in Egypt to destroy British trade and influence in the area. He defeats a Mameluke army at the Battle of the Pyramids. But, the British destroy his fleet at Aboukir Bay. 1799 Napoleon conquers Middle and Upper Egypt before he returns to France. 1801 The French in Cairo and Alexandria are compelled to surrender to the British. 1807 With the support of the Mamelukes he defeats the British forces which had occupied Alexandria and Rosetta and forces them to withdraw. 1827 In the Battle of Navarino in the Greek War of Independence the Turkish and Egyptian fleets are annihilated. 1832 After Turks defeated by Russians, Mohammed Ali shakes off Ottoman Suzerainty and advances into Syria. 1841 The Turkish Government grants hereditary soveriegnty to Mohammed Ali and his heirs. 1854 Said takes over. He is an enthusiastic moderniser and supports construction of the Suez Canal. 1867 Ismail is made Khedive of Egypt and achieves political autonomy. However, he embarks on a hugely expensive modernisation programme. 1875 Disraeli buys the Khedive's 40% holding in the Suez Canal company. Britain is now the largest single shareholder. 1881 British and French stewardship brings finances under control. However, this loss of independence causes a nationalist uprising led by Urabi Pasha. 1882 British forces land at Alexandria. French forces were intended to take part in the operation but domestic political problems precluded their involvement. The British bombardment of Alexandria and the defeat of the Nationalists at Tel-El-Kebir means that British power is now paramount in Egypt. 1884 Gordon sent to Khartoum to organise its evacuation. He remains there and is killed by the Mahdi's forces. 1885 Britain and France declare the Suez Canal neutral. 1892 Abbas II Hilmi becomes the Khedive, but his actions are limited by the British authorities. 1896 General Kitchener launches British and Egyptian army to recapture the Sudan. 1898 Mahdists defeated at Omdurman. Potential flashpoint with French at Fashoda is averted. 1899 Sudan declared to be an Anglo-Egyptian condominium. 1904 French confirm that British power is preeminent in Egypt. Upsurge in Anti-European feeling. 1922 Egypt declared independent, but with Britian retaining responsibility for maintenance of communications, defence, protection of European interests and the question of Sudan. Sultan Fuad becomes King Fuad I. Tutankhamen discovered. 1929 Britain agrees to withdraw some troops from Egypt, but not from canal zone. 1935 Anti-British riots. Two dead, 88 hurt. 1936 Anglo-Egyptian treaty signed, Farouk II becomes King. 1940 Italians bomb Suez Canal and enter Egypt from Libya. 1946 Anti-British riots, bomb explodes in British Services Club in Alexandria. 1953 Britain and Egypt discuss future of Suez Canal. British families advised to leave Egypt. 1954 Britain agrees to withdrawal of 65,000 servicemen. Nasser ousts Neguib. 1955 Israelis raid Egyptian held Gaza strip. Britain and Egypt agree to independence of Sudan. 1956 Nasser assumes full executive powers and nationalises Suez Canal Company. Expels British, French and Zionist residents. British, French and Israeli forces react. But, diplomatic problems force the withdrawal of the British and French armies. Israel keeps Gaza strip. Curzon: The Last Phase 1919-1925. A Study in Post-War Diplomacy.